Three Bartlett Students awarded RIBA President's Medals in 2013 were invited to present their work in a lively and constructive crit at the RIBA on 25 February. Ben Hayes, Ness Lafoy and Tamsin Hanke gave presentations about their work to an audience which included their tutors Niall McLaughlin, Yeoryia Manolopoulou, Michiko Sumi, Ben Addy, Rhys Cannon and Frosso Pimenides. 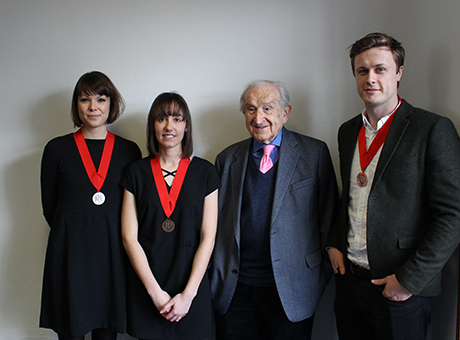 They were joined by Professor Joseph Rykwert, who received the Royal Gold Medal for Architecture on the same day. The Royal Gold Medal for Architecture, one of the world's most prestigious architecture awards. Given in recognition of a lifetime's work, the award is given to a person or group of people who have had a significant influence 'either directly or indirectly on the advancement of architecture'. Joseph Rykwert is a world-leading authority on the history of art and architecture; his groundbreaking ideas and work have had a major impact on the thinking of architects and designers since the 1960s and continue to do so to this day. Educated at the Bartlett School of Architecture (1942-1944) and the AA, Rykwert has held a number of university teaching posts in the UK and US and has lectured at The Bartlett. He is currently Paul Philippe Cret Professor of Architecture Emeritus and was Professor of Art History at the University of Pennsylvania.